Indian cooking challenge is the event started by srivalli where in she features a recipe all the members have to prepare it and post it before the deadline.I came to know about this from my dear friend rekha. 1.Heat 2 tsp of ghee in a kadai, roast cashew nuts and raisins. 2.Roast the coconut. Keep aside. 3.Add the remaining ghee and roast the Rava till nice aroma starts coming. 4.In a bowl take all the roasted Rava, Nuts, Coconut and add the Cardamom powder. 5.Then add the sugar. Mix well.Then slowly add the warm milk into the bowl. Check if you are able to gather as balls. When you find that milk added is enough to get you laddos, transfer it back to the kadai and cook in sim for 2 mins. Mix well and then cover it and let it rest for 2 mins. Then immediately make balls or laddoos. PS.I followed srivalli recipe.But when i started making the balls milk was not enough so i sprinkled 4-5 tbsp of hot milk and made the ladoos. *Marinate mutton pieces in curd, salt, turmeric pwd, chilli pwd, ginger garlic paste and lemon juice and keep aside for half an hour. *Heat oil in a vessel,add onions and green chillis and saute till transparent. 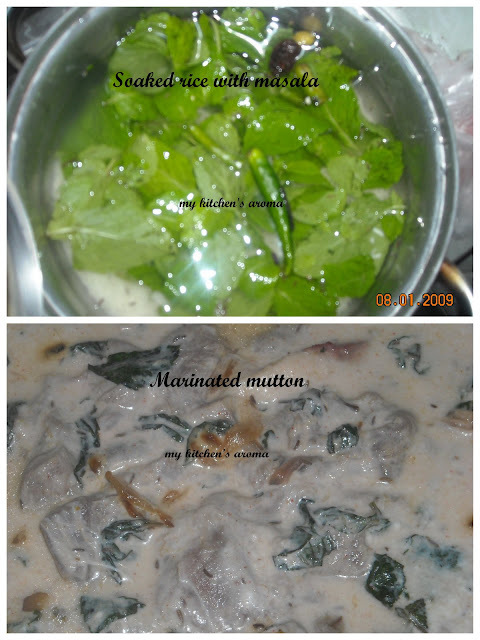 *Add the sauted onions to the half cooked mutton and cook on high heat for 3-4 mts. 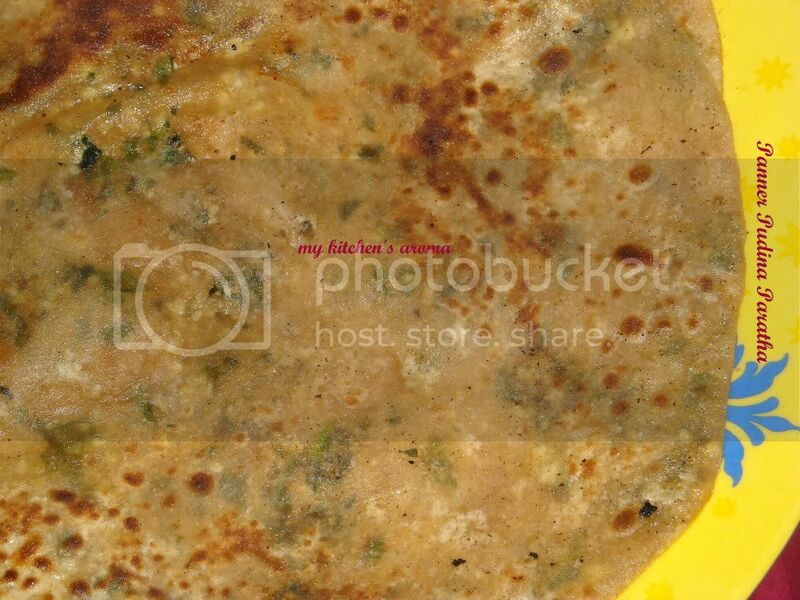 *Add coriander powder, cumin powder and garam masala powder and mix well. Add a cup of water and adjust salt. *Bring to a boil and reduce heat and cook for another 10-12 mts. 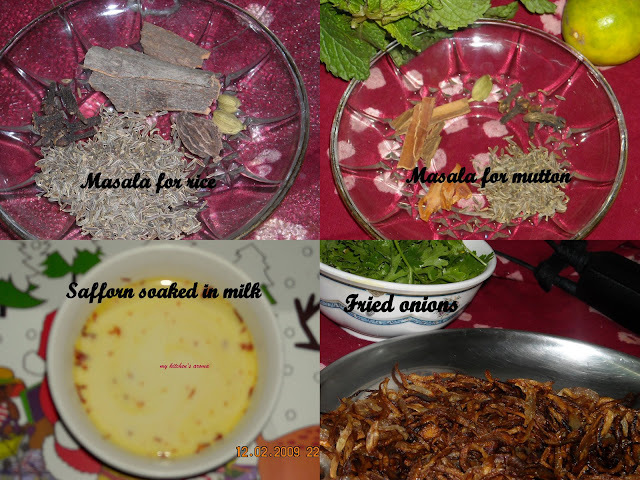 *Add the washed gongura leaves by roughing tearing them and mix well. 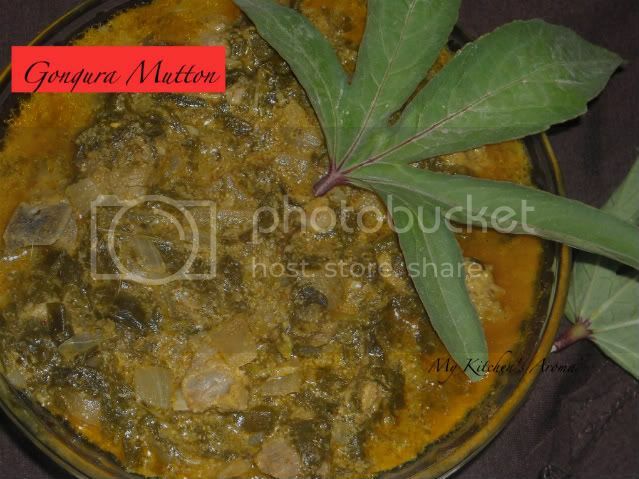 *Close the cooker with a lid and cook till the mutton pieces are soft and well cooked and the leaves have blended well with the mutton masala base. Cook all the fruits together on low heat till very soft and pulpy. Add sugar and continue to cook till it begins to leave the sides. Let it cook and then chill. 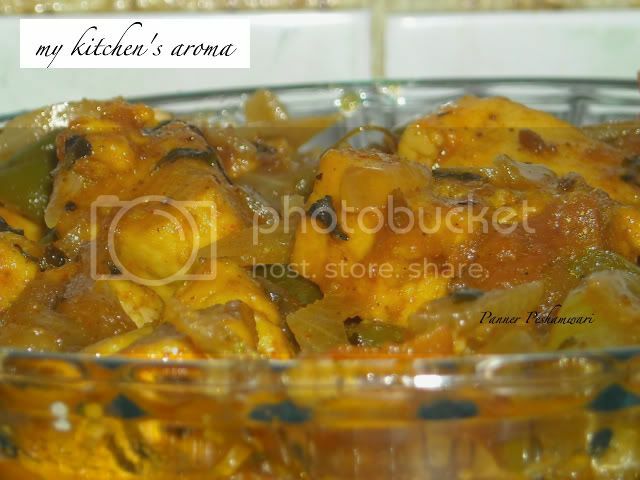 *Then add chopped onions and saute until light brown colour. *Add ginger garlic paste and chopped tomatoes. *Cook till oil comes out. *Mix turmeric powder,jeera powder,garam masala powder and pepper powder with 2 tbsp of water and add to the gravy. *Now add green chillies and saute for 2 minutes. *Then add sliced onions,sliced tomatoes,capsicum and 8-10 tbsp of water. *Mix and cook for 2-3 minutes. *Add cashew paste and salt taste. *Cook for another 4-5 minutes. 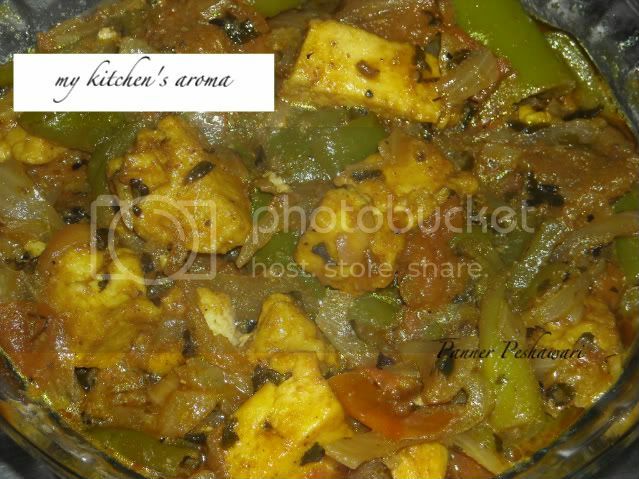 *Lastly add crushed kasoori menthi and paneer cubes and cook for another 5 minutes or until panner is soft. *Sift the flour and baking powder in a mixing bowl and set aside. *Grease the tin with butter and dust it with some flour. *Divide the dough into two equal parts. 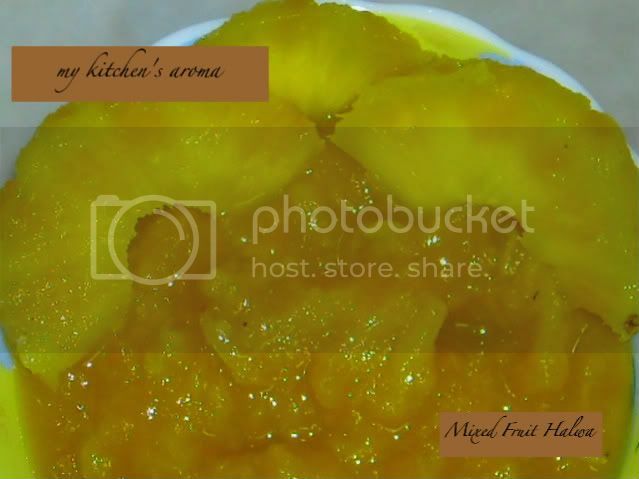 *Pour the one part of the dough in the tin and spread the mango jam on top of it. *Then pour the other part carefully and sprinkle tutty fruitys on the top. *Bake at 200 degree for 50minutes.If the tooth pick when inserted comes out clean than the cake is done.The temp setting depends on the microwave/oven used. *Combine wheat flour and salt into a smooth dough. *Mix grated panner,pudina and salt. *Fry on non-stick tawa with oil. Soak rice+ urad dal+methi seeds for 2hrs in water . grind to a fine thick batter. Add salt & mix well.Keep aside for 6-8hrs to ferment. Heat it on one side only and serve it hot with onion coconut chutney. And also to EFM "Breakfast Recipes" and "Variety Rice Recipes hosted by Srilekha of Me and My Kitchen. Last one week was very boring as my laptop has gone for a toss and i was not able to figure it out what went wrong.I changed the adapter and battery and at last hubby's friend took the laptop and fixed the errors.I was not able to read or comment on any of the blogs which i visit regularly and my apologies to everyone. 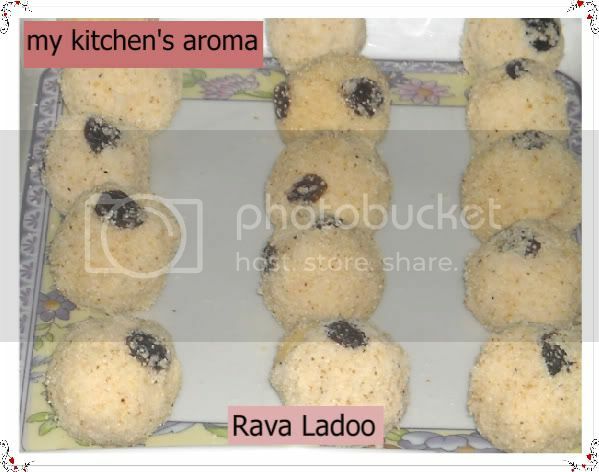 My elder daughter used to very thin and very bad eater.She just hates dal and vegetables.My younger sister gave me this ladoo recipe when i went to hyderabad and my kid liked it very much and i make it a point to give her one everyday. *Fry all the above ingredients except jaggery and ghee. *Remove skin of peanuts.Let all the ingredients cool. *Make coarse powder of all the ingredients and add crushed jaggery and ghee. *Store in a air tight container. Warning:- Post is very lengthy but worth reading and making it. When we think of biryani the first thing we get in our mind is the famous dum biryani of hyderabad.Apart from pearls hyderabad is famous for its dum biryani.Biryani is of two types pakki and kacchi gosh biryani.Pakki biryani is where mutton/chicken is cooked and layered with half cooked rice and kacchi gosh is where raw mutton/chicken is layered with half cooked rice. Both of these types are cooked in dum i.e. bowl in which the mutton and rice are layered and sealed with chapathi dough and hot charcoal is placed above that and the flame should be kept at low so that the mutton and the rice is cooked in this slow process. We must ensure that vapours do not escape. Sealing with the dough is a cumbersome process, so I use aliminum foil to seal it and don’t use charcoal. I have been cooking this biryani every Friday since last 5 years, one can only close to the art of mastering biryani by preparing it regularly. Learnt this biryani from a aunty in Muscat (oman) who is from Hyderabad. Had many disaster with this like once forgot to add oil,didn’t add salt, didn’t add lemon. Now I can say with convection that I have come close to perfecting the art of preparing Dum biryani.This is my mom’s and m-law favourite biryani. 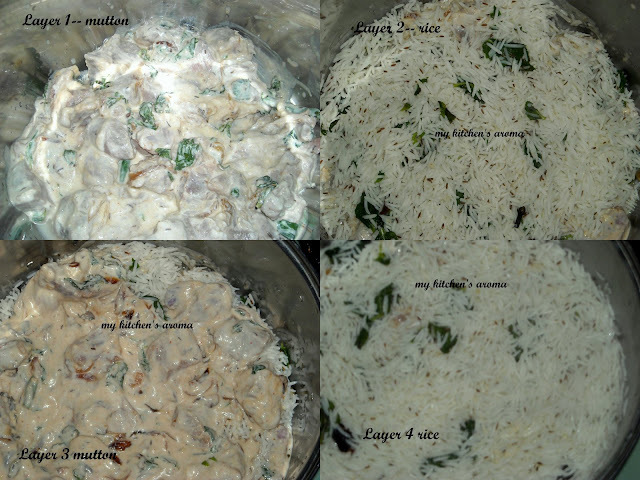 The taste of biryani depends upon the rice used.I use Pakistani basmati rice, which is one its kind. 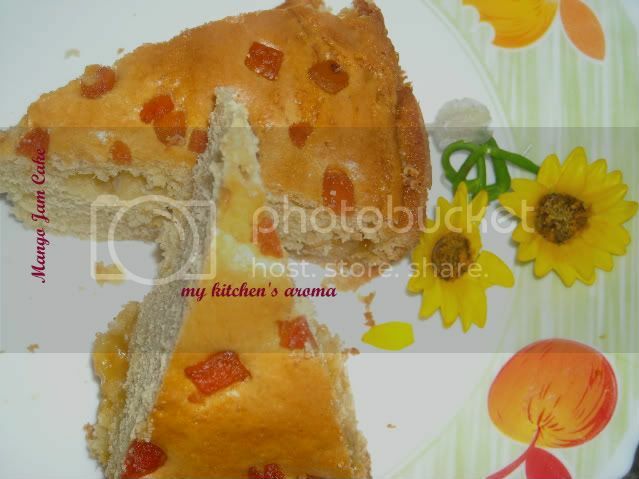 Before I start writing recipe, I am happy to share with you all that I made century with this post.And thank you all for your encouraging comments and your support has helped me to reach here.Now coming to the recipe. Soak rice with all the above ingredients for 2-3 hours. *Chop onions and deep fry onions.Keep half of the onions aside. *Soak safforn in the milk for 2-3 hours. Step 2*Cook soak rice and add salt.Cook till rice is half cooked. Step 3*In a thick bottom vessel spread 2 tbsp of oil.Spread half of the marinated mutton. *Spread half of the rice.Squeeze 1 tbsp of lemon juice,sprinkle garam masala,2tbsp of oil. *Then spread rest of the mutton followed by rest of the rice.Squeeze 1 tbsp of lemon juice,rest of the garam masala and 2 tbsp of oil. *Now spread fried onions over the rice and sprinkle safforn soaked milk. *Cover the vessel with aliminum foil and put it on the stove. *Firstly put on high flame for 30 sec and reduce to low flame and cook exactly for 30 minutes. *Once switch off the flame,don't open.Let it stand for another 10-12 minutes. 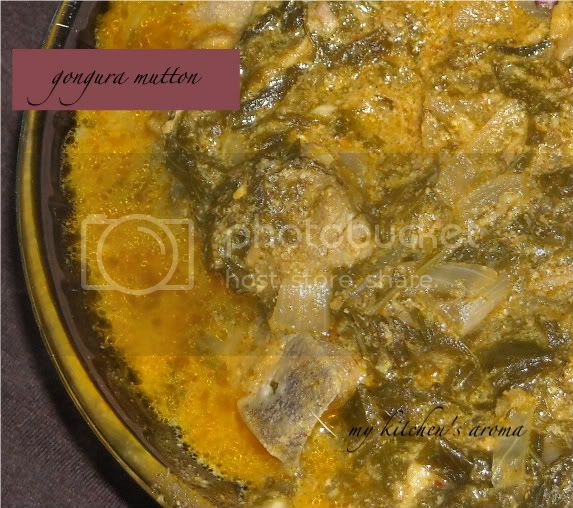 This is best served with mirchi salan and raita.Mirchi salan recipe is here. Note: Oil which is used to deep fry onions can be used in the layers. Vapours should not escape, the foil should be very tight and if possible place a container with water above the foil so that vapours doesn't escape. EDITED to add few new snaps.. This is simple alo fry yet delicious. My mom did this when she was here. Chop potatoes into thin pieces. Put all the chopped pieces in a bowl with water for 2 min,and wash thoroughly. Heat oil,when hot add potatoes with very little water.If much water is added, potatoes pieces will become mushy. Add salt. Fry till they are golden brown in colour and add pepper powder. I had my eyes on this fry since i got married.Had to wait for seven long years to make this and eat.This was served in my wedding dinner,sob sob i was the last one to eat my wedding dinner and believe me i was served only two bendis. Got this recipe from a book which i own since long but never attempted it.When i did it came out very well.Will write about the book review soon for the event at EC.This recipe is not for the health conscious people. Chop off heads and tails of the okra and slit lenghtwise into 4. Take 1/2 cup of besan and mix all the ingredients in a bowl except rice powder and oil. Mix remaining 1/2 cup besan,rice powder and little salt and toss with okra. If the okra are too dry and besan is not sticking to it,sprinkle little water and mix it. Be carefull while mixing it. Deep fry in batches until crisp. I have just copy pasted the recipe from the book and only addition i did is that i sprinkled little water as the bendi was too dry and besan was not sticking to it. Heat oil in a pan, fry the red chillies for a minute. Remove and keep aside. In the remaining oil, fry coriander seeds, cumin seeds and grind with red chillies until smooth. Add salt, tamarind, garlic and blend to a smooth powder. This goes to the JFI event hosted by queenspice and started by Mahanandi.